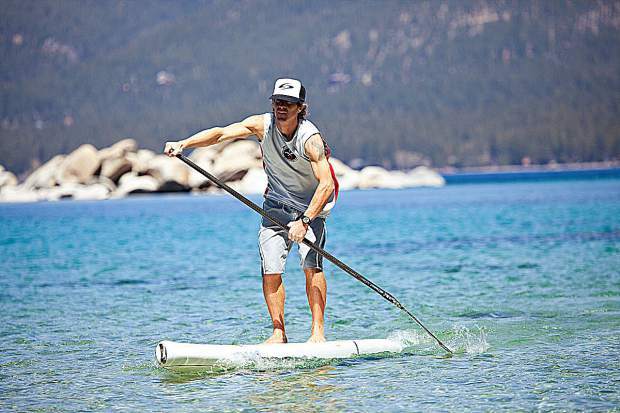 John Merryfield paddles on what's been an annual trip for the past decade around Lake Tahoe to inspire people to eat a plant-based diet. For 10 years in a row I have stand-up paddled non-stop, 72 miles around Lake Tahoe to inspire people to eat a plant-based diet. I’ve had a plant-based diet now for over 32 years, and I wanted to show others that they could be healthy and strong while living vegan. It takes me between 14-17 hours without stopping to paddle the 72 miles depending on wind, weather and other variables. Alone, the fatigue can ricochet around in my mind and body like an echo chamber. There is no one there to help diffuse the powerful incoming messages of I can’t, and it’s too difficult. Every single negative thought I could imagine thinking of occurs every year while paddling the entirety of Lake Tahoe. The undulating waves of strength-exhaustion- exhaustion-strength, and the accompanying hope-despair yo-yo during endurance paddles are extreme. When I arrive back in Kings Beach where I started, some 15 odd hours later, I hop off my board into the pristine waters of Lake Tahoe and dig my feet into the sand until feeling returns to my toes. I bathe in the blissful buzz of stillness. This year was my last and final SUP circumnavigation of Lake Tahoe. Why, you ask, given the joy and delight of the physical suffering from endurance SUP paddling? Well, I won’t miss the agony and the ecstasy, but my mission in life won’t change. My commitment has been, and always will be, to help people wake up. In the book, “Why We Love Dogs, Eat Pigs, and Wear Cows,” psychologist Melanie Joy explores why people are disgusted by the thought of eating a golden retriever, but happily enjoy beef, chicken, pork and seafood. The belief system that eating animals is normal, natural, and necessary keeps animal suffering largely out of people’s awareness. It seems as though the reason why people eat animals is because people eat animals. Wait, what? In other words, the reason why most people eat animals is because … most people eat animals. People do what other people do. And to be fair, it’s not just the herd mentality at work. The propaganda machine of the meat and diary industries uses brilliant, yet deceptive ad campaigns to put a happy face on products that cause bad health, harm to the environment and cause suffering to animals. The industry also uses legislation to try to keep the public from seeing the harm it causes with so-called Ag-Gag laws, where the filming of animal cruelty, not the cruelty itself, is a crime. For example, the industry standard practices such as cutting off the tails of animals, de-beaking, confining animals in small cages, and slaughtering them while they are young are commonplace. As a result, the consumers keep consuming, leaving little opportunity to question why we eat what we eat. For now, I’m taking a break from paddling non-stop around Lake Tahoe. Perhaps I’ll focus more on my writing to create the change I want to see in the world for animals. Or I will surf more. Or I’ll sit under the Bodhi tree to pray and meditate for our awakening. I’m not exactly sure what my future looks like. But I do know this, while I am still upright and breathing, I will tirelessly work to end filthy, inhumane slaughterhouses. I vow to help others realize that violence done to the least of us, is violence done to all of us. I believe that the Golden Rule of “doing unto others” should be extended to our animal brothers and sisters. Today, consider doing something different. No, you don’t have to paddle 72 miles around Lake Tahoe. Consider going vegan. You can start by having a meatless Monday. Or like me, go vegan one day at a time. A more compassionate world begins with you. John Merryfield is co-author of the book, Vegan 1 Day, Stories of Living the Good Life and lives in Kings Beach.